WikiLeaks founder Julian Assange says the site is about halfway through preparing the additional documents. (CNN) -- The founder of WikiLeaks said Thursday the whistle-blower website is preparing to release another roughly 15,000 documents about the war in Afghanistan. "We are about halfway through them," Julian Assange told reporters in London, England. "This is a very expensive process." The Pentagon on Thursday warned WikiLeaks against releasing more documents. "It would compound a mistake that has already put far too many lives at risk," said Geoff Morrell, deputy assistant secretary of defense for public affairs. "The only responsible course of action for them is to immediately remove all the stolen documents from their website and expunge all classified material from their computers," he said. "If they were to publish any additional documents after hearing our concerns about the harm it will cause our forces, our allies and innocent Afghan civilians, it would be the height of irresponsibility." But Assange said he is "absolutely" committed to moving forward with the release. 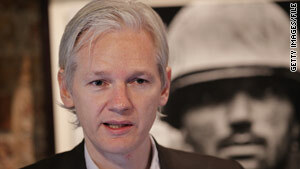 "A lot of the recent criticism about Afghanistan was totally expected," Assange said Thursday. "Every time we take on one of these big organizations, they try and try to find various ways to criticize us, and there might even be some legitimate criticism in this case," he said. "But we did try hard to keep back some material." The Defense Department has demanded WikiLeaks return all documents belonging to the Pentagon and delete any records of the documents, Morrell said last week. "The only acceptable course is for WikiLeaks to take steps immediately to return all versions of all of these documents to the U.S. government and permanently delete them from its website, computers and records," Morrell said. Assange has previously said his Web site has an additional 15,000 documents that it wants to publish but that it is redacting information that could endanger people named. Through The New York Times, the organization has asked the Obama administration for its guidance on what to redact. A recently published report suggested the site has asked the Pentagon directly as well. Morrell, however, denied that claim last week. "WikiLeaks has made no such request directly to the Department of Defense," he said. Morrell stated that other steps would be considered if WikiLeaks is not willing to cooperate. On Thursday, Assange continued to allege that the Pentagon had been unresponsive to his requests. "So far we have had no assistance, despite repeated requests, from the White House or the Pentagon or in fact any of the three press organizations that we partnered with for this material, (who) decided not to take responsibility for actually getting the raw data out to the public." "That in fact appears to be our role," he said, "...to get the raw data out to the public." Several humanitarian organizations have reached out to WikiLeaks to warn that the leaked documents it posts on its site could endanger the lives of civilians whose names appear in them. On Thursday, the international journalists' group Reporters Without Borders wrote a letter to Assange that accused his group of showing "incredible irresponsibility," by publishing tens of thousands documents from the Afghanistan war last month. The letter said that "revealing the identity of hundreds of people who collaborated with the coalition in Afghanistan is highly dangerous. It would not be hard for the Taliban and other armed groups to use these documents to draw up a list of people for targeting in deadly revenge attacks." Other groups have asked WikiLeaks to redact names in the tens of thousands of secret documents already posted, as well as to be more careful to "protect civilians" in subsequent document reviews, according to an official from one of the other human rights groups. That official did not want to be identified because the communications were intended to be private. The groups include Innocent Victims in Conflict, Amnesty International-Afghanistan and the Open Society Institute.